Bose Soundlink is a compact and affordable speaker that sounds good. If you compare it with other popular speakers, then it is light in weight and small. But, the audio is loud and this is where it scores. The audio is clear and there is no distortion even if you play your music on full volume. The battery performance is good but the backup is average. It has 8 hours of playback time, which is less if you need it for long music sessions. The music is not at all restrained and you can hear every genre clearly. However, it can suffer in high-frequency range but that is again not a big issue. Bose SoundLink Color has a good Bluetooth functionality. There is no issue in connectivity. The speakers are available in so many different colors so you can take your pick. The previous speakers by Bose were good so you can expect the same with this speaker. However, considering the price, the features are limited. If you are looking for full functionality in this speaker, then you would be disappointed. Also, the speaker is not ideal for large parties. You can play it along in confined space so this is actually a disadvantage. Still, it is a good buy for the price. If you want a decent sounding speaker for your regular use, then Bose SoundLink Color is an ideal choice for you. In fact, the speaker is so compact that you can carry it along while traveling too. In the full range, the audio is clear and crisp. The wireless connectivity of the speaker is amazing. If you want to integrate it with other devices, then you have your choice here. In fact, once you integrate it with your playlist, you can play along with all your songs at a stretch. There is no problem of connectivity, which is an added advantage of the speaker. This speaker can also be your motivation. As you can play it along with your gym sessions, it can help you remain fit. As its durable, you can use it roughly. Even if you drop the speaker, there won’t be an issue with the audio performance of the speaker. It suits your active mobile lifestyle so that you never miss on our favorite beat. It also lets you connect to two Bluetooth devices at one time. This is great if you want to hear your music loudly. It’s compact in size so you don’t have to worry about its weight too. There are many great features of the Bose SoundLink Color speaker, let us look at some of them. The sound in full range is clear being compact in size. This is an amazing feature of this speaker. Bose SoundLink Color speaker has voice prompts that make the pairing of devices an easy task for you. It offers a great wireless connection with all your devices including tablets and smartphones. This compact speaker features volume, power and connectivity buttons. You can also control other functions of the speaker from your Bluetooth-enabled device. The speaker plays your preferred tunes from your favorite Bluetooth device. The audio is loud and clear in the full range. Being small also, it’s easy to use. You will have no issue with the speaker. The speaker is available in many colors, so you can easily take your pick. Bose SoundLink Color speaker is made from durable fabric and it has rounded edges that give it a great shape. In fact, it’s so compact that you can carry it along while traveling too. The connectivity of the speaker is also good and it has a good range of 30 feet. Bose SoundLink Color speaker features amazing voice prompts that let you play your music in integration. It pairs with other Bluetooth devices to give you a great music performance. It can easily connect to two devices at a single time. The rechargeable lithium-ion battery of the speaker gives you up to eight hours of playback. You can recharge with the help of a cable or with most USB power sources. Recharging the speaker is not a great deal with so many resources. Once charged, you can play your music on the loop. It delivers a full power performance and sound is quite balanced. It does not distort even if the volume of the speaker is on the higher side. The speaker is not only light in weight but also super small. 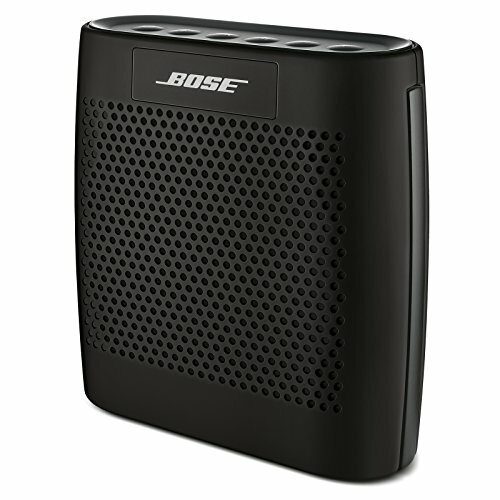 Bose SoundLink Color speaker plays loudly with a different frequency range. The price of the speaker is tad affordable. If you compare Bose SoundLink Color speaker with other compact speakers, then this wins hands down. The design is not only stylish but there are an array of colors to choose from. The design is simple but the rounded edges give it an extra edge. The speaker has a rubber surface with side stripes. There are sound holes and buttons that are on the top but with a neat interface. There is a micro USB charging spot that lets you charge your speaker with any device. Though, its compact, it’s also sturdy. Even if you drop it several times, the audio won’t really get affected. As its light in weight, you can also carry it in your sling bag. You cannot expect exceptional sound performance from a compact speaker. Still, Bose SoundLink Color gives you an amazing performance in sound. The bass is good as most Bose speakers have a great bass. The low frequency is not that good, so you will be disappointed here. The mid-range and high range of the speaker are also restrained. However, this does not really affect the actual sound even if you hear it on a higher volume. The overall sound performance is adapted and it gives you a great listening experience. There is no leakage or distortion even if you play your music loudly, so this is actually a good thing about the speaker. Bose SoundLink Color speaker is compact and it features six buttons on the top. You can easily pair any Bluetooth device with the help of these buttons. The connectivity of the speaker is also good as you can connect it with two devices at a time. The highlight of the speaker is its voice prompts. It’s handy to use as the pairing becomes simple. The controls feature play and pause button and that makes it easier to operate. Overall, control features have a nice interface and it’s handy. The software gets updated when connected to a pairing device. The setup of this speaker is simple and that is what makes this a popular choice for music lovers. Bose SoundLink Color speaker scores high in performance. As its compact, the sound quality does not suffer. The base range of the speaker is amazing. It lets you play your music loud and clear. The speaker performs at a higher volume too as its designed in a restrained way at a higher frequency. There are two different drivers and a single bass radiator that makes the job easy. If you compare this speaker with different speakers in the similar range, then this is a much better option. The sound quality is perfect so you will not complain. Its compatible with various devices and it also features special voice prompts. With a full charge, the battery of Bose SoundLink Color speaker can last up to 8 hours. Well, this is not that great but for the price, it offers the battery life gives you a decent backup. You can play your music loud with this feature. But, battery also depends on your volume control. It can drain quickly if you hear it too loudly. The connectivity of the speaker is good and it does not lose connectivity while playing your music. However, it can suffer in a different range. The range of the speaker is not that great. You can experience a signal loss over 25 to 30 feet. So, this is a major drawback of the speaker. The range is not good. It has an average build quality. Bose SoundLink Color speaker is a good wireless speaker with a decent sound performance. The build is compact and the features are great. Though, it suffers a bit in the battery department. The best part about this speaker is it’s available in a range of colors. You can easily choose a color you love. The higher frequency is good but it can suffer in the lower range. The speaker does not have any playback and connectivity issues. For the price, it does the job well. In fact, if you compare it with other sparkers in this range, and then this one is worth your money. You can simply buy this sweet compact speaker for an amazing price.